Arcadia: April 11. Elevation below normal, water 62. Largemouth bass good on spinnerbaits and crankbaits. White bass good on light colored 2-inch grubs. Channel catfish good on cut shad. Crappie good on minnows and jigs at 2 ft. along rocks. Report submitted by Tim Campbell, game warden stationed in Oklahoma County. Hefner: April 12. Elevation below normal, water 58-65 and clear. Largemouth bass good on jigs and crankbaits at 2-6 ft. around shallow structure. Smallmouth bass fair on crankbaits and jigs at 2-8 ft. around shallow structure. White bass good on sassy shad and crankbaits at 2-10 ft. along rocky banks. Channel catfish good on cut bait and stinkbait at 10-20 ft. along the dam. Flathead catfish good on cut bait at 15-20 ft. along the dam. 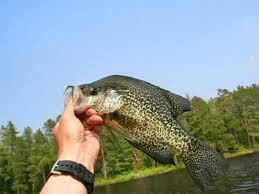 Crappie good on jigs at 4-12 ft. along the dam moving to shallow water. Walleye good on crankbaits, jerk baits, sassy shad and grubs at 2-6 ft. along the rocks at the dam late. Report submitted by Lucky Lure Tackle. Overholser: April 10. Elevation 5 1/2 ft. below normal, water 66-68 and murky. White bass and striped bass hybrids fair to good on minnows and jigs along the west side rocks and around the docks. Channel catfish fair on chicken liver and worms. Crappie slow to fair. Report submitted by Joey Rushing, game warden stationed in Oklahoma County. Thunderbird: April 10. Elevation 3 ft. below normal, water murky. Crappie good on minnows and jigs at 6 ft. on structure. Saugeye good on jigs, medium-diving crankbaits and earthworms at 6-8 ft. off points. White bass good on jigs, small spinnerbaits and minnows in the river. Largemouth bass fair on plastic worms and spinnerbaits in coves with structure. Report submitted by Tony Woodruff, game warden stationed in Cleveland County. Wes Watkins: April 11. Elevation 4 1/2 ft. below normal, water 68 and clear. Largemouth bass fair on spinnerbaits and plastic worms. Crappie fair on minnows and jigs at 4-6 ft. Report submitted by Mike France, game warden stationed in Pottawatomie County. This entry was posted on Saturday, April 16th, 2011 at 11:38 am	and is filed under Baitcasting Reels, Spinning Reels. You can follow any responses to this entry through the RSS 2.0 feed. You can skip to the end and leave a response. Pinging is currently not allowed.